Idle thoughts to start the new year: Just wondering if the manufacturer of Spam, Hormel Foods Corporation, has its computers equipped with Spam filters. Not thrilled with the Gingrich 2012 New Year’s slogan – “Out with the oldt, in with the Newt”. 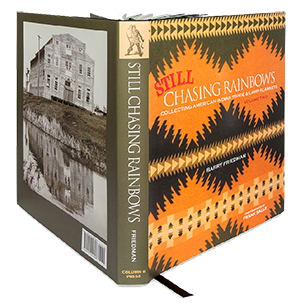 BIG NEWS: We’re actually making progress on “Still Chasing Rainbows” and are now hoping for late summer/fall publication. The photographs are turning out sensational and the text is beyond brilliant. I think this may be my best work since my epic “Shingles And Shakes: A Roofer Remembers”. BONUS BIG NEWS: The only show I exhibit at all year, High Noon, rolls around January 28 and 29 in Mesa, Arizona. This is the top Western and Indian antique show in the country and if you’ve never attended, you’ve probably never met me and that, my friends, represents a giant gaping hole in your life. If you play your cards right you may be invited to come to my house in Phoenix and see 150 or so great blankets for sale and my personal collection, which is not for sale, but I welcome obscenely irresponsible cash offers. If you’d like to make arrangements for the tour de farce I can be reached at 602-595-1157 or by e-mail at blanketboy@cox.net Remember, always free hot dogs and balloons for the kids! 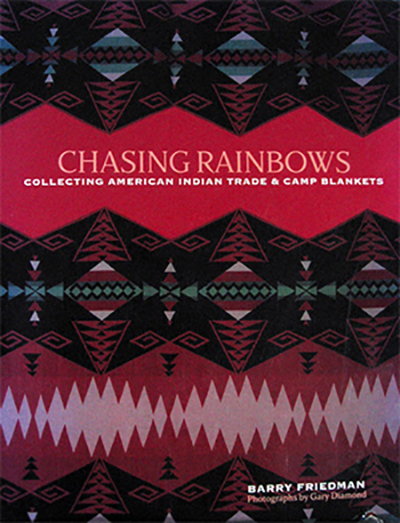 2012’s first Blanket Of The Month is a Capps variant Navajo pattern c.1911 that retains its original label and I won’t say anything else about it because my New Year’s resolution is to try very hard to be a better listener.